Oh noes! A cut little penguin with no ability to move around on its own is stuck on a random platform and you have to carefully phase the platform out of existence to drop the penguin onto the safety of a target on the floor and to make sure that no part of the platform touches the icy artic water… because you know, their made of pollution and global warming. 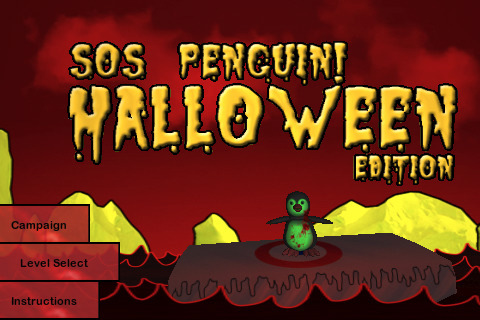 Released by Stefan Mensen, SOS Penguin! Is available on the iPhone and iPod touch for $0.99. The premise is cute. You have to save a penguin! Come on people! It’s a penguin!! The game uses a really strange physics system where before you touch anything on screen, the pieces rest perfectly fine, then the second you start the puzzle, it just starts to slide all over the place. The penguin is a 3D object that will fall all over the place, including forward and backwards. It’s mostly luck on how you destroy the different blocks and how they affect the penguin’s fall. Gameplay forces you to replay the same level constantly. The sound effects of the penguin become incredibly annoying but the background music is actually pretty good. 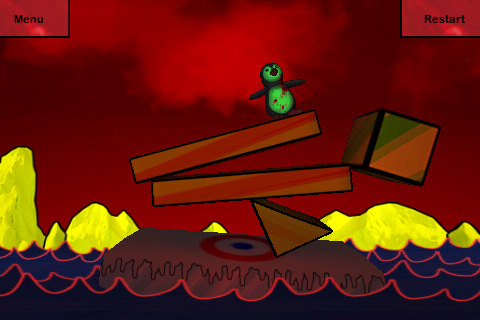 The game will end if you let the penguin land anywhere but the target and if your blocks fall into the water. Touching a block removes it so it’s all about which block to remove first. Some puzzles requires that you tip the penguin towards the goal, others involve very quickly removing a whole set of blocks so the penguin lands just right, and others will have you trying to keep certain blocks in place to bounce the penguin back into the center. SOS Penguin! has 48 puzzles with some fluctuations in the difficulty, but overall, the game has a pretty good replay value. The physics almost always come out different with every play through but overall, it’s a great way to play some puzzles AND save the penguins! Penguins!!!!!!!! AppSafari review of SOS Penguin! was written by Joseph Ho on October 26th, 2010 and categorized under App Store, Games, Physics Based, Puzzler. Page viewed 3486 times, 1 so far today. Need help on using these apps? Please read the Help Page.